Jackie Robinson was born in Cairo, Georgia, but never really knew anything about his birthplace because his mother, Mallia, decided that the best place to raise her children would be in Pasadena, California. It seemed strange for Jackie to be in a place where there were few black people and probably even stranger when there were instances when he was denied the same rights as his peers. As a young man with great athletic promise the YMCA would have been the perfect place for him to blossom, but he was not allowed to join. Everyone around him noticed how good he was at sports and often the other “children offered him extra food from their lunches if he would play on their side.” With five children in the Robinson family, it was an offer he couldn’t easily refuse. When Jackie was a boy, African Americans still bore the brunt of racism and were “second-class citizens.” His mother “taught them to stand up for their rights,” a lesson he took to heart throughout his life. He wasn’t one who would move to the back of the bus. His athletic ability naturally nudged him toward a career in baseball, but in those days he would only be able to play for the Kansas City Monarchs. The pay was great, but getting lodging or even a restaurant to serve them was problematic and discouraging. In spite of the problems, a man named Branch Rickey who claimed that he was “looking for a ballplayer with guts enough not to fight back” to insults and slams he would receive in pro baseball. Jackie Robinson, would be the first African American in major league baseball. Would Jackie be able to hold his temper when racial slurs were slung his way? Could he keep his composure when men would attempt to injure him? This is an excellent portrait of Jackie Robinson, the first African American major league baseball player. There are several children’s books coming out now that portray courageous men who not only stood up for their civil rights, but also stood up for others. 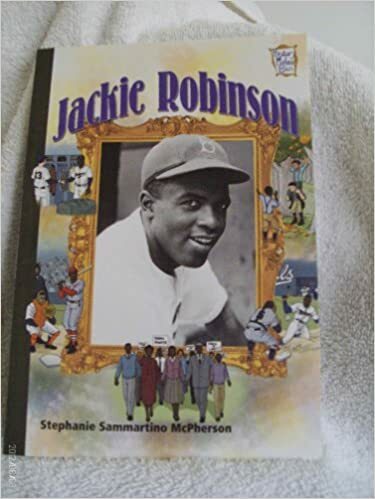 I’ve read several books about Jackie Robinson and think this one is particularly well done. I came away with a feel for his personality, his heart and certainly an appreciation for his courage. There are numerous informative sidebars scattered throughout the book. The book is peppered with many interesting photographs, including one of his mother and siblings. In the back of the book is a timeline, an index, a select bibliography and additional recommended book and website resources. Was Jackie a member of a gang? You’ll just have to read this book to find out! Quill says: This fascinating portrait of not only a sports great, but a courageous civil rights activist will thrill the young sports enthusiast!